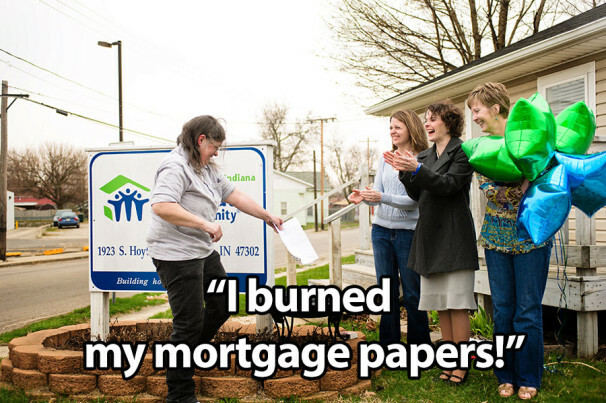 ~Connie McVicker burned her mortgage papers in 2011! Connie McVicker and her husband Jimmie purchased their Habitat home in September of 1994 – the 10th family to purchase a home from Muncie Habitat. Connie’s husband, Jimmie, was a quadriplegic as the result of a car accident in 1971 when he was 22 years old. To fulfill his sweat equity hours, Jimmie answered phones and used a wand held in his teeth to work the typewriter at the Habitat office. Connie was actively involved at the construction site. Connie recalls that shortly after they purchased their home in 1994, her aunt sat them down and gave them some very good advice. She told them to always pay more than the amount of their mortgage payment – no matter how large or small an amount, always pay more. Connie and Jimmie took those words to heart. In the years since, Connie’s husband, Jimmie, passed away, as did her aunt. But in April of 2011, on the birthday of Connie’s late aunt – less than 17 years into her 25 year mortgage with Habitat, Connie McVicker proudly made her final mortgage payment! We invited Connie to the Habitat office a few weeks ago where she shared her story, her memories, her photo albums and some tears. Afterwards, we all went outside and, in true Habitat tradition, Connie lit fire to her mortgage papers! It was a proud day for her and a memorable day for all of us.